A simple yet challenging gap control drill this week. Coaches start with the puck in the corners, forwards are on the blue lines, D at the red line. Two D step out, receive a puck from Coach, move the puck D-D, take a shot on net. As soon as the shot is released, two forwards leave from the blue line, one with a puck. They have to cross in the zone, grabbing a piece of the circles before attacking the two defensemen 2v2. These are the fundamental elements of the drill. The nuances of this drill are many. First, Coach can challenge the D by sending the puck up the wall in a variety of ways – off the glass, on the runner, bobbles, etc. Second, the forwards can be given conditions which affect the way they play, including a certain number of required exchanges, mandatory crosses, etc. The drill can also end with a 2v2 net front battle for positioning and screens for the point shot. This drill can be challenging for defensemen – they need to focus on strong and powerful C cuts (NO crossovers! ), maintaining an excellent gap, having strong stick position, staying inside the dots, pivoting when necessary in zone, and using their positioning and leverage to keep the forwards to the outside. The goal for the defensemen should be to either break up the rush or force the forwards into the corner. Forwards need to generate speed on the attack, put pressure on the defensemen through crosses, net drives, etc. Look to shoot and crash the net. 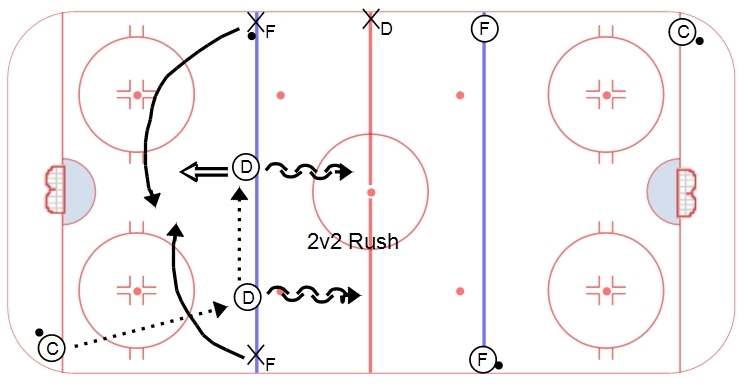 Create a 2v1 by angling and attacking one defensemen. Should the D not try to hold the blue line in this drill? Rather then a battle in their corner?